The availability of enterprise hosted cloud services has opened huge potential for companies to effectively manage files. The files can be stored, shared, exchanged within the enterprise and with their partners efficiently while keeping existing security and audit controls in place. The service provides the power and flexibility of public cloud while maintaining the data control. The main challenge of enterprise hosted cloud services is to guarantee high uptime (in the order of seven nines) while maintaining high quality of service. The dependency on such services means that any disruption to the service can have significant productivity impacts. Enterprise cloud services typically consist of multiple different services to provide the functionality and any High availability architecture must take into account that all critical services need to have redundancies built into them to be effective. Moreover, detection and handling of failures must not require any user interaction as well as be reasonably quick. FileCloud enables enterprises to seamlessly access their data using a variety of external agents. The agents can be browsers, mobile devices, client applications, while the data that is enabled for access by FileCloud can be stored locally or in internal NAS devices or in public cloud locations such as AWS S3 or OpenStack SWIFT. Depending on the specific enterprise requirements, the FileCloud solution may implemented multiple different software services such as Filecloud Helper service, Solr service, virus scanner service, Open Office service etc. Moreover, FileCloud may use the enterprise identity services such as Active Directory or LDAP or ADFS services. Any failure on any of these services can impact end user experience. FileCloud solution can be implemented using the classic three tier high availability architecture. The first tier will consists of the load balancer and access control services. Tier 1 will be a web tier made up of load balancers. Tier 2 will be stateless application servers and for FileCloud implementation, this layer will consist of Apache nodes and helper services. Tier 3 will be the database layer. Any other dependencies such as Active Directory or Data servers are not addressed here. The advantage this architecture is separation of stateless components from state full components allowing great flexibility in deploying the solution. Tier 1 is the front end of the deployment and act as the entry point to all external clients. 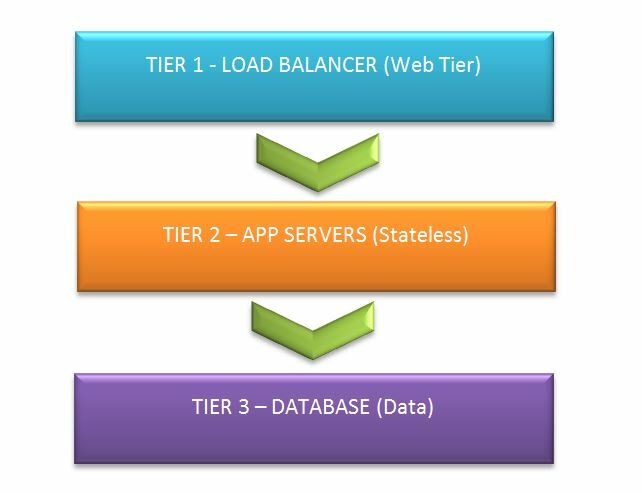 The components in Tier 1 are stateless and primarily forward the request to the webservers in tier 2. Scaling of the web tier can be done by adding and removing load balancer instances since they are stateless. Each webserver node is capable of handling any request. This layer can also be configured to do SSL offloading allowing lighter weight communication between Tier1 to Tier2. This layer can also be configured to provide simple affinity based on source and destination addresses. The traffic will be forwarded to healthy application server nodes. This layer also monitors available application servers and will automatically distribute the traffic depending on the load. The apache servers in FileCloud do not store any state information and are therefore stateless. They however do cache data for faster performance (such as convert and cache documents for display). They primarily execute application code to service a request. All state specific data is stored in database tables and therefore are stateless. If an application server node fails, the request can be handled by a different application server node (provided the clients retry the failing request). Capacity can be increased or reduced (automatically or manually) by adding or removing apache server nodes. FileCloud helper service provides additional capabilities such as indexed search, NTFS permission retrieval etc. FileCloud Helper is a stateless service and therefore can be added or removed as needed. Similar to FileCloud helper service, the Antivirus service is also a stateless service providing antivirus capability to FileCloud. Any file that is uploaded to Filecloud is scanned using this service. Memcache service is an optional service that is required for local storage encryption. This service is also stateless and is required only if local storage encryption is required. This service is also started in same node as the Apache service. Open office service is an optional service that is required for creating document file previews in browser. This server is stateless and is started in the same node as the Apache server. The High availability for each of these servers varies depending on the complexity of the deployment. The failure of these services can have limited or system wide impact. For example, MongoDB server failure will result in FileCloud solution wide failure and is critical, while FileCloud helper server will only impact a portion of function such as network folder access etc. MongoDB servers store all application data in FileCloud and provide High Availability using replica sets. The MongoDB replica set configuration provides redundancy and increases data availability by keeping multiple copies of data on different database services. Replication also provides fault tolerance against the loss of a single database server. It is also possible to configure Mongo DB to increase the read capacity. The minimum number of nodes needed for Mongo DB server HA is a 3 node member set (It is possible to also use 2 nodes + 1 arbiter). In case of primary Mongo DB server node failure, one of the secondary node will failover and will become primary. The heartbeat time frame can be tuned depending on system latency. It is also possible to setup the Mongo DB replica to allow reads from secondary to improve read capacity. 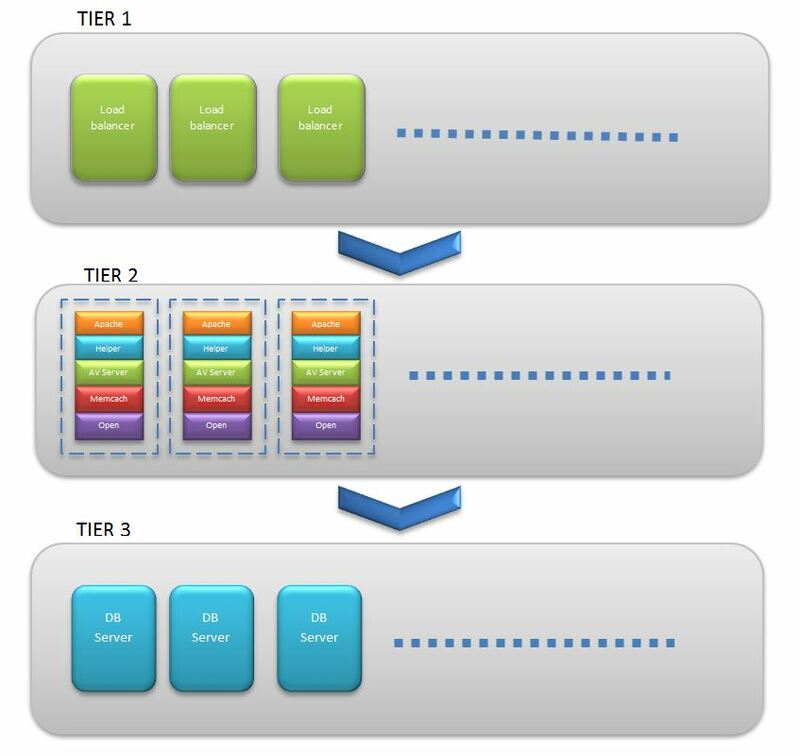 The three tier structure for FileCloud component is shown below. The actual configuration information is available in FileCloud support. This provides a robust FileCloud implementation with high availability and extensibility. As new services are added to extended functionality, the layer can be decided whether or not they are stateless or store state. The Stateless (Tier 2) nodes can be added or removed without disrupting service. Tier 3 nodes will store state and require specific implementation depending on the type of service. Alternative to PowerFolder – Why FileCloud is better for Business File Sharing?